MySQL Installer downloads and installs a suite of tools for developing and managing business-critical applications on Windows. The suite consist of applications, connectors, documentation, and samples. During the initial setup, choose any predetermined setup type, except Server only, to install the latest GA version of the tools. Use the Custom setup type to install an individual tool or specific version. If MySQL Installer is installed on the host already, use the Add operation to select and install tools from the MySQL Installer dashboard. 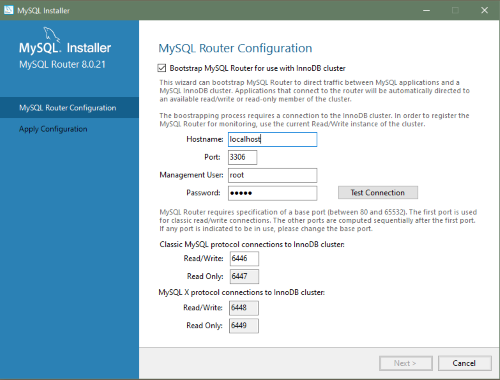 MySQL Installer provides a configuration wizard that can bootstrap an installed instance of MySQL Router 8.0 or later to route traffic between MySQL applications and an InnoDB cluster. When configured, MySQL Router runs as a local Windows service. For detailed information about using MySQL Router with an InnoDB cluster, see Routing for MySQL InnoDB cluster. You are prompted to configure MySQL Router after the initial installation and when you reconfigure an installed router explicitly. In contrast, the upgrade operation does not require or prompt you to configure the upgraded product. Set up InnoDB cluster. For instructions on how to configure a sandbox InnoDB cluster on the local host using MySQL Installer, see Section 1.3.3.1.1, “High Availability”. For general InnoDB cluster information, see InnoDB Cluster. Port: The port number of the primary server in the InnoDB cluster. The default is 3310. Management User: An administrative user with root-level privileges. Password: The password for the management user. Read/Write: Set the first base port number to one that is unused (between 80 and 65532) and the wizard will select the remaining ports for you. The figure that follows shows an example of the MySQL Router configuration page, with the first base port number specified as 6446 and the remaining ports set by the wizard as 6447, 6448, and 6449. Click Next and then Execute to apply the configuration. Click Finish to close MySQL Installer or return to the MySQL Installer dashboard.